A youth advocate, chef and lifelong North Philadelphia resident, Ariq Barrett saw a lack of role models in his community and wanted to reach youths on a different level. His solution? 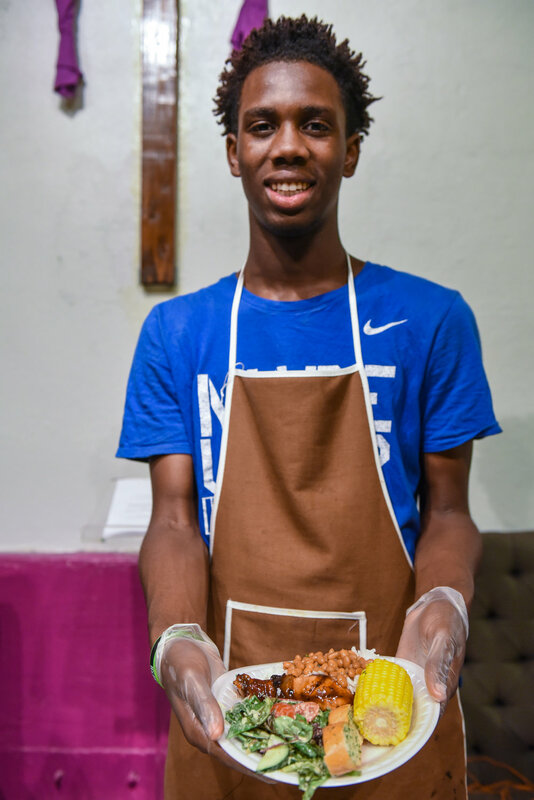 Black Boyz Can Cook is a program that creates a space where young black boys could learn the principles of healthy eating, entrepreneurship, community service and brotherhood through food. After he completed culinary school, Barrett spent years volunteering with youth at Education Works and Youth Build. In 2013 he launched the I AM HUMAN campaign to address stigma in the LGBTQ+ community. He knew there would be a way to bridge connect his culinary skills to advocacy. So Barrett founded Black Boyz Can Cook last summer on his own dime. For a year, the program was free for participants. This summer, a $30 per month fee was implemented to help fund community outreach projects. Barrett says partnerships take time, but the need for youth advocacy can’t wait. “My passion is based in working with kids and giving back to people who are less fortunate but at the same time it’s blending the two,” Barrett said. The home base for Black Boyz Can Cook is in a humble space in a rehabbed warehouse off Hunting Park Avenue in Nicetown. Truth and Life Empowerment Community Ministry donated its sanctuary space for Barrett and his young chefs to use in the mornings, Monday through Friday. Previously, the group was meeting in the kitchen at Reign’s Events, where Barrett is the lead chef for the banquet service. Looking for a more convenient location for parents, Barrett approached Truth and Life’s pastor, Clarence Hayes, in June for permission to use the ministry’s space. The program separates the kids into two groups. Chef Juniors, from ages 4 to 13, learn their food groups, how to build a recipe and often school the older kids on the book etiquette of how to run a kitchen, Barrett says. Chef Proteges, from ages 14 to 18, get more of a hands on experience while taking on a mentorship role that comes naturally when working side by side with younger children. In July, Barrett officially opened up the program to girls on Mondays, Wednesdays and Fridays, calling the additional program Girlz Can Cook Too. Walker, 17, met Barrett when she began waitressing at Reign’s. She was the first girl to enter the program when she joined in April as a volunteer to help with the younger chefs, but has picked up a few lessons of her own along the way. Not all of the young chefs in the program want to build a career in the kitchen, so Barrett makes the environment universal. On Fridays, they fundraise. In July, each young chef was challenged to concoct their own style of lemonade. From Blueberry Blast to a peach twist on a classic Arnold Palmer, each participant created and sold their product at a lemonade stand on Broad Street and Allegheny Avenue – and made a personal profit while they were at it. Barrett said they sold out faster than expected. Community outreach is a core principle of Barrett’s mentorship programs. Mixed in with weekly cooking lessons, trips to the movies and pool days at the local recreation centers, the young chefs engage in service activities. Every Wednesday, the team embarks on a field trip to deliver food they have prepared the morning of to elderly members of the community on what Barrett calls the Edible Express. The Chef Juniors get excited to participate in community outreach activities because they feel a sense of inclusion. Barrett says no one is too young to give back, or to recognize that something as simple as a warm meal can go a long way for people in need – whether it’s at home or in their communities. “My mom put me in this program so I can cook for her when she’s sick,” Saeed Thompson, 6, said. 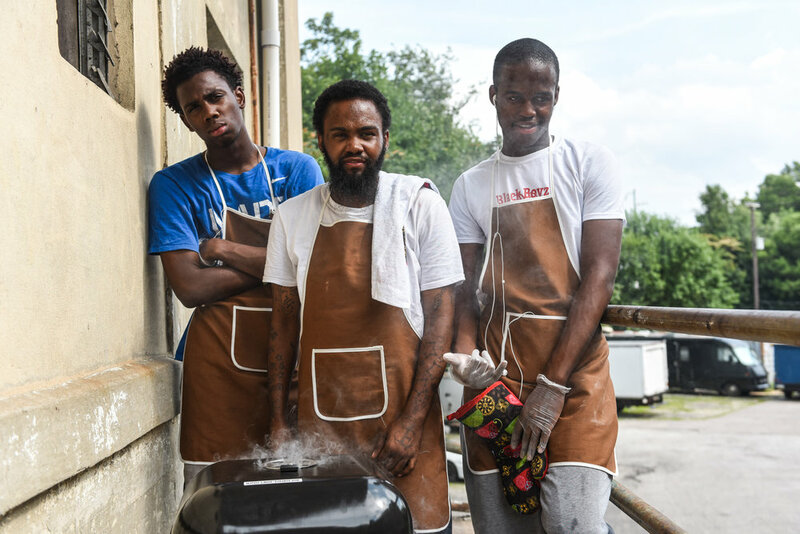 Once a month, Black Boyz Can Cook hosts Breakin’ Bread, where the young chefs utilize their new skills to prepare a large, home cooked meal and an open door. For the July event, the program partnered with Truth and Life Empowerment Community Ministry, as a thank you of sorts. The event drew a crowd of about 30 people on a Wednesday night. On the menu was a summertime barbecue, complete with caesar salad, chicken drumsticks, rice, corn, garlic bread. It took all morning for the chefs to prepare the food, fire up the grill and get dinner in line. Chicken sizzled on the charcoal grill long after the younger chefs had gone home for the night. Overall, the event cost more than $150, which Barrett paid for independently. With pride, chefs took care of the service and the church brought the crowd. Before dinner, Pastor Hayes said grace, with a special thanks to Barrett and the young chefs in Black Boyz Can Cook. “What Brother Ariq is doing is so unique is taking the time to let the black youth know that there is someone who cares for them, and there’s someone that wants to see them grow and be empowered to be who they can be,” Hayes said. With his hands folded, and head bowed, Cameron Davis, 15, grinned. It was Davis’s first day in the program – he was the first to arrive and the last to leave. “It feels good to know we made this food, and it’s helping people,” Davis said.